Rotocone Vacuum Dryer (RCVD) is suitable for drying of materials which cannot resist high temperature, material which are easily oxidized, volatile materials which should be retrieved, materials which are strong irritants and poisonous in nature. RC h the improved technology integrates during operation under vacuum. The Rotocone Vacuum Dryer RCVD facilitates enhanced drying efficiency, low temperature operations and economy of process by total solvent recovery. It helps cGMP based working by achieving optimum dust control, while offering advantages of efficient charging and discharging of materials. The drying unit equipped with lump breakers initially breaks large lumps and subsequently powders them (in single cone). The rotary action of the dryer together with mechanical action of the breakers cuts down drying time and gives a lump free product. 50 Ltrs, 100 Ltrs, 150 Ltrs, 200 Ltrs, 250 Ltrs , 300 Ltrs, 350 Ltrs, 400 Ltrs, 500 Ltrs, 600 Ltrs, 700 Ltrs, 750 Ltrs, 800 Ltrs, 1000 Ltrs, 1200 , Ltrs 1500 Ltrs, 1600 Ltrs, 1700 Ltrs, 2000 Ltrs, 2300 Ltrs, 2500 Ltrs, 2700 Ltrs, 3000 Ltrs, 3500 Ltrs, 4000 Ltrs, 4500 Ltrs, 5000 Ltrs. Vacuum Tray dryer is the most commonly used batch dryer. They are box-shaped and loaded and unloaded via a door (two doors on the larger models). Inside are several heating plates mounted one above the other on which the product is placed in trays. The bottom of both heating plates and trays should be as smooth as possible to permit heat transfer between plates and product. The medium flowing through the heating plates is water, steam or thermal oil. The distance between the heating plates is determined primarily by the surface loading and the foaming of the product. To avoid retrograde condensation, the cabinet walls are indirectly preheated by the heating plates. Next, the product is introduced and heated at atmospheric pressure. Only after all individual product trays reach the same temperature the cabinet is evacuated and drying can start. The preheating phase is very important in order that the drying curve and the foaming of the product is identical throughout the cabinet, During the main drying phase, the vacuum is in the range of 40 to 80 mbar abs and in the final drying phase, vacuums of only few mbar abs are reached. Heating temperatures are normally on the range between 800C and 1100C. Depending on product and surface load, drying takes from a few hours to 1 to 2 days. For some products, the vacuum and temperature profiles are automatically controlled in order to prevent a pass over of the critical product temperature. The dimensioning of the vacuum system is an important factor in the design of drying cabinet systems. Used mainly for drying of high grade temperature and oxygen sensitive products. Highly suitable for drying hygroscopic substances, which is dried to very low residual moisture content level. Frequently, vacuum drying cabinets are the sole possibility for drying lumpy, glutinous products. Standard models range from 4 Trays to 96 Trays. Bodies may be of cylindrical or rectangular cross section. Both shelves and body are heated (the body is heated to prevent internal condensation) with controlled circulation of hot water, steam or diathermic fluid. Vacuum is drawn through large diameter ducts to minimize working pressures. Both, rotary and static dryers can be supplied with the following optional ancillaries. 3 Trays, 4 Trays, 6 Trays, 12 Trays, 24 Trays, 36 Trays, 48 Trays, 96 Trays. Available in GMP model and NGMP model. SS 316, SS 304 and MS.
Our company designs high grade Dryers, widely installed in dairy, food, chemical and pharmaceutical industries. These dryers produce instant powder with minimal deposition in chamber. It takes lesser downtime for maintenance and has winch driven special cleaning lift. Further, these are completely expandable in design. These are developed using prime quality stainless steel metal that provides robustness and durability to the machine. It is available in various forms and capacities as per the requirement of our clients. Our dryers have dense dryer chambers, including roller veneer feeding decks and cooling section. The drying ovens are normally available with choice of heating mode, as electrically heated/steam heated and thermal fluid heated. In electrically heated model, digital temperature controller is provided with digital timer to facilitate working day and night. In steam and thermal fluid heated model, digital temperature indicator is provided with digital timer, but the temperature controller is not supplied with the machine. Tray dryers are used for the best drying results in conventional process. Drying oven is specially designed for Bulk Drug, Pharmaceuticals, Chemicals, Food, Paints, Textiles and other industries. 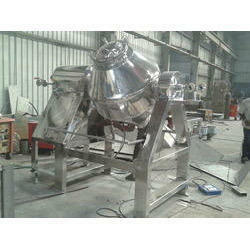 It is well accepted for economical drying of powder, granules, food material and chemicals. Tray Dryer is fabricated out of rigid angle iron frame with double walled panels insulated with best quality compressed fiber glass and with a rigid door fitted with strong hinges and best chosen locking arrangement. A control panel is fixed in front of the oven to facilitate the operation. It is manufactured from SS 304, SS 316 or SS 316L (As per customer requirement) GMP/CGMP model and polished to the mirror finish in the inside matt finish on the outside. It has a large working space and is available, manufactured from mild steel and in good finishing outside with synthetic enamel colour and inside painted with heat resistant paint to resist temperature up to 300 deg, in standard model. 3 Trays, 6 Trays, 12 Trays, 24 Trays, 48 Trays, 96 Trays. Bodies may be of cylindrical or rectangular cross section. Both shelves and body are heated(the body is heated to prevent internal condensation) with controlled circulation of hot water, steam or diathermic fluid. Vacuum is drawn through large diameter ducts to minimize working pressures. Both, rotary and static dryers can be supplied with the following optional ancillaries. · Heater system for either pressurized hot water or diathermic fluid. Solvent recovery system with condenser and receiver, vacuum pump and ancillaries, characteristics and dimensions depending on the drying processes.Hollow pad type heating shelves, which are easily removable for maintenance. · Condensers and condensate receiver fixed in the dryer body or stand alone for remote installation.External fluid heating of dryer with protective panels in stainless steel or mild steel power coated. · Dedicated fluid heating and circulating systems. These can be steam or electrically heated. Fluid heating systems are available for water as well as thermic fluid(for temperature requirements above 95 deg) Can be designed to customers specification requirements. · Steam sterilizable models available. · Double door loading available for large models.